Athletic, Betis and Rayo claim derby honours. With just a point to separate the top two, the league title went down to the wire though there were to be no shocks as Atleti stormed past already relegated Zaragoza leaving Barcelona’s will over Levante superfluous. Elsewhere Athletic, Betis and Rayo all claimed last-day derby wins over Sociedad, Sevilla and Madrid as Valencia bested Albacete before Tenerife hit Espanyol for three and Huelva picked up three points at home to Santa Teresa. Already confirmed a fifth-place finish no matter the outcome of the Saturday kick-off in Albacete, Valencia’s first half double was enough to ensure the visitors finished the season with a win. Knocking on the door for the first half hour, Las Ches took the lead ten minutes before the break when Débora was given room to cut into the box, her low strike enough to evade Andrea Ríos. The lead doubled seven minutes later when Marta Peiró found Marianela Szymanowski in the box with a lofted ball, the Argentine free to curl it past Ríos and give the visitors a half time cushion. The dominant side in the tie, Noelia Bermúdez was rarely called into action in the away goal, the Valencians unable to further their advantage after the break. 21,500 fans turned out at the Estadio Municipal de Anoeta to watch the Basque derby, former champions Athletic too much for a resurgent La Real as they claimed a third-place finish, keeping Tenerife at a distance, Sociedad forced to settle for seventh. Asking questions from the sixth minute when Lucía García was denied by a certain goal by Núria Mendoza just ahead of the line after the teenager had slipped beyond Mariasun. The traffic wasn’t all one way however and Leire Baños soon drew a strong diving save out of Ainhoa Tirapu, The deadlock broken 23 minutes in when Ramajo volleyed Erika Vázquez’ dinked cross inside of the near post with the bottom of her thigh, leaving her ‘keeper little chance of reaching the ball. A persistent threat this term, Vázquez added a second ten minutes later when she wove through the defence to knock the ball into the bottom corner to give the visiting side a strong advantage at the break. Clinical when in, Las Leonas made it three soon after the restart, Mariasun left on the turf after trying to turn Vanesa Gimbert’s header over, the ball cannoning off of the bar and expertly met in mid-air by Nekane. Soon enough three became four, García’s tenacity in front of goal paying off as she responded well in the box to pounce on Ramajo’s header to pull the ball across her body and fire it beyond Mariasun. There was at least a conciliation for the hosts to be had two minutes later when Chini reacted at Manuela Lareo’s floated corner to lash the ball high into the net. 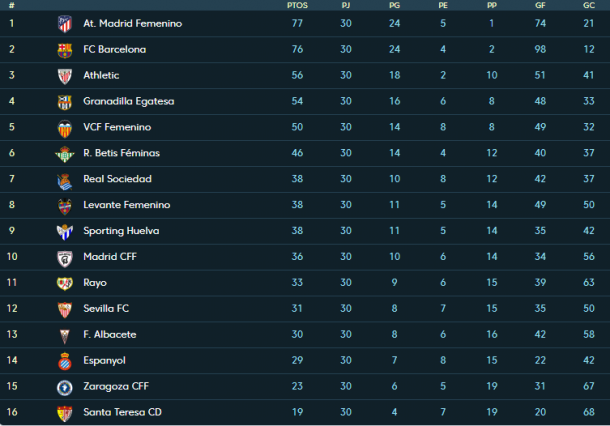 In relegation danger at one point, Huelva were determined to continue their fine run of form that’s seen the side from Andalucía pick up 13 points from a possible 15 in the five leading up to the last day of the season. Confirmed to a last-place finish, Santa Teresa did well to hang in away from home, testing Sarita Serrat where possible whilst keeping things tight at the back. Lacking a killer touch for large swathes of the match and denied by Yolanda Aguirre when they were in, Sporting finally broke the deadlock ten minutes from time when Pachu’s neat header curled over the stubborn ‘keeper. The lone goal enough to separate the two at the whistle. Four points clear of Las Ches and just two shy of Bilbao, Granadilla took to the pitch in San Adrián de Besós aware that they could yet finish the season third should there be a surprise result in the Basque-derby. Off and running little more than fifteen minutes in, the visitors took the advantage through Paloma Lázaro, the advantage soon stretched by Ana González when she took aim from range. Though the Periquitos looked for a response, they struggled to find their best footing going forward and were hit for a third and final goal in second half stoppage time when Megan Crosson found González, the attacker with her fifth of the season. After climbing the table with aplomb, the Béticos struggled with a run of fixtures that saw them play the five teams above them, the side from Seville continuing to struggle when against teams further down the table. Dealt a surprising loss by Sporting last time out, the Béticos did well to mine a win against a struggling Sevilla side. Close but not close enough throughout the first half, Betis saw the better chances though both sides were left wanting when it came to a final touch. 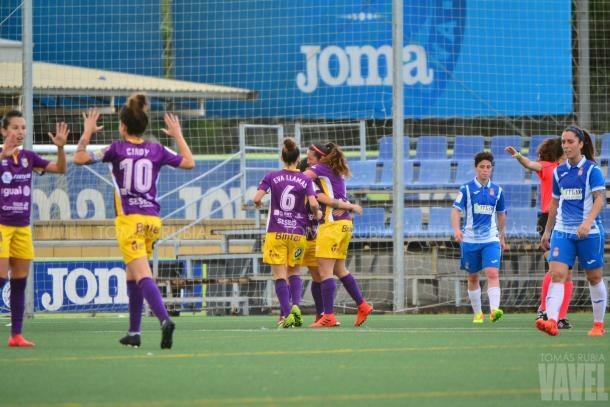 The match decided early in the second half when Virgy’s low ball found Ana sneaking in at the back post, the defender’s first goal of the season enough to claim all three points and give them a confidence boost going into the Copa de la Reina. Having won the title on the last day of the season in 2016-17, Atleti were in a similar position coming into their last outing of the season, though this time it was the side from Madrid who were top of the table needing to avoid an upset. Against already downed Zaragoza, the visitors wasted no time, asserting their dominance from the off to wrap the title up without breaking a sweat. Needing just three minutes, Ludmila poked the ball home from two yards out, the hapless home defence unable to clear the danger from Kenti Robles’ cross. Las Colchoneras soon had a second when Soni’s whipped free kick sailed over the wall as Oihana batted it into her own net, Amanda Sampedro on the line to make doubly sure. The home defence continued to part like the Red Sea in front of Moses though it took another twenty-five minutes for the visitors to claim a third, Soni’s ferocious free kick clipping the underside of the bar before bouncing behind the line. Needing just another two minutes to add a fourth, Ludmila squared for Angela Sosa in the box, the 25-year-old requiring no more encouragement to pull her foot back and slip the ball into the far corner. Sosa the one to add the fifth 20 minutes into the second half, her low effort from the edge of the box picking up and skipping through the area to evade Oihana and find the bottom right corner. Down and downed, there was at least a conciliation for the Aragonese side when Darlene found herself sandwiched between Andrea Pereira and Mesi in the box, the Brazilian tripped and the one to take the resulting penalty. Guaranteed to do nothing to affect the scores, the 28-year-old stepped up and fired the ball clinically into the top left corner with Lola sent the wrong way. Awarded a penalty at the other end after Soni had ben pulled down in the box, the visitors couldn’t extend their lead as Sampedro fired her shot over the bar, the loss mattering not as Atleti still found a sixth. Playing a bit part this season, making most of her appearances off of the bench, Esther Gonzalez added the sixth and final goal late in the day, having been brought on 23 minutes previously. Running in behind, the 25-year-old finished off a one-two with Soni, bringing the ball down before popping it past Oihana, the match and title well won. A breathless match from the off, Madrid took the lead eleven minutes in as Mascaró claimed her seventh goal of the season, the visiting team looking to put an end to a run of seven matches without a win. But against a Rayo side without a win in their last eight outings, Madrid soon found themselves pegged back, a quick fire double from the hosts enough to give them the edge at the break as first Silvi then Sheila turned the tie. Battling not just for a win but for the last berth for the Copa de la Reina with a win, Laura Del Rio needed just two second half minutes to restore parity, the visitors still two points off of cup qualification with a draw. With the game finely poised and the hosts having the better of it, the Rayistas were dealt a blow twenty minutes from time when Jeni was shown a second yellow card and they were reduced to ten. Digging in well, the home side restored their lead just four minutes later as 32-year-old Natalia claimed her 350th goal for the club, her gambit enough for all three points in Madrid. With their European spot well wrapped up for the coming season, Barca knew they needed a win in Buñol to give them any hope of clinching the title, their dominant performance not enough for top honours given the result in Zaragoza. Peppering Noelia Ramos’ goal from the outset, the Catalans soon broke the deadlock, Melanie Serrano’s deep ball forward chested down by Patri for the teenager to sweep into the far corner. One became two on the half hour when Lieke Martens ran unmarked through the box to nod Serrano’s whipped cross in at the near post leaving little room in the way of a comeback for the Granotes. Getting forward infrequently a long ball over the top gave league top goalscorer, Charlyn Corral something to chase, the Mexican goal-getting drawing a fine save from Sandra Paños to keep the hosts at arm’s length. The match put beyond any doubt on the hour when Marta Torrejón claimed her seventh goal of the campaign, flicking Martens’ recycled ball home for Barca’s third. With Corral still trying to make things happen for the hosts, the visitors soon had a fourth, Nataša Andonova’s effort from range dropped off of the bar and left Andressa Alves with an easy poach to nod past Ramos before the ‘keeper could return to her feet. Determined to take something from the match, Levante were left empty-handed when first Corral’s effort clipped the crossbar before Carol Marín’s follow up ricocheted off of the other end of the woodwork. The match wrapped up by Andonova five minutes from time, the Macedonian in the right place to score Barca’s 98th goal of the season, the ball delivered to her feet after Alexia Putellas had pressured Ramos at a goal kick. With the net left unguarded, Andonova took a touch before looping the ball home.